Discover all advantages of a Luxembourgian life insurance contract. High class savings solutions available from 50.000 euros for investors who are looking for an unmatched level protection for their assets. Luxembourg life insurance, for whom ? Legal entities subject to corporate tax (French IS) and with heritage purpose or foreign heritage structure. How much it pays [+%]? The Luxembourgian life insurance is an investment envelope with high flexibility. The choice of investment vehicles is unlimited. So the yield depends on the performance of the kind of fund you will choose among all different ones. Source by Quantalys. 18 years observed period: from 01/12/2000 to 10/07/2018 | *Past performances do not guarantee future returns. The Super Privilege: Investors are admitted as senior creditors.In case of the failing or the bankruptcy of the insurer, it enables to insured subscribers to recover their capital in priority to all other creditors. The segregation of assets: Insurance companies in Luxembourg must deposit all assets they held in an independent bank of the company, which is approved by the Insurances Commission, the Luxembourgian official authority for the supervision of the insurance sector. An unlimited guarantee for your deposits by nature. We are talking about the notorious triangle of security. Learn more about the high level protection of Luxembourg life insurance. Access to more than 1,500 funds, bonds, live equities, quoted and not quoted. Contract allowing to invest with several currencies (€ euros, US dollars, British £ …). Creation of an Internal Dedicated Fund (IDF) from 250,000 euros (Management company manages your capital as a perfec match, according to your aim). Two euros funds with competitive guaranteed capital including the famous Eurocit, secure euros fund invested to 70% of the general assets of La Mondiale and 30% Equity funds with free management to search the performance on the market. Eurocit from La Mondiale has an average return of + 4.15% per year upon 5 years*. * Past performances are not a reference for futur return. Your Luxembourg life insurance policy is based on the well known principle of fiscal neutrality which prevails in so far, as France and Luxembourg signed a longstanding tax treaty. The latter provides that only applies the imposition of their country of residence, to policyholders and beneficiaries. Thus French tax residents, by subscribing your Luxembourg life insurance policy, you will enjoy the hyper benefit tax of the life insurance, in particular after 4 years and mostly after 8 years (the date of the first payment starts the fiscal seniority counter). In case of death, the capital is transmitted to the recipient (s) designated by you, with tax free, up to a specific threshold. * Depending on the amount of your initial payment and the various Luxembourg-life insurance contracts. Contrary to what people might think, our Luxembourgian life insurance contracts are absolutely open, while offering a high level of service equivalent or even clearly higher to other solutions. As an entry ticket worth € 50.000 in initial deposit only, we offer the more affordable Luxembourg life insurance in the market thus far. We emphasize that your capital remain 100% available. A unique target: as a broker, we find you the best financial terms for your contract.Try us, we will prove it. The Luxembourg life insurance is a great investment solution, not only dedicated to the wealthiest.The absolute guarantee offered for your capital is an unmatched asset in France and Europe. Investment opportunities are countless Subscribe to a Luxembourg life insurance is choosing the security and flexibility for your financial investment. Expatriates, business executives, investors looking for more various investment solutions than France will find full satisfaction. In addition, your Luxembourg contract keeps all the benefits of a traditional life insurance in terms of taxation ongoing life and in terms of transmission in case of death. Close to the Luxembourgian life insurance, the capitalization contract is another Luxembourg investment solution for natural or legal persons on heritage purpose. The capitalization contract allows you as a natural person investor to enjoy advantages in donation and wealth tax in France (ISF). For legal entities, Luxembourg capitalization contracts are an excellent cash investment for the medium and long term. To learn more about the operation and advantages of the Luxembourg capitalization contract. A reactive Luxembourgian »pure player », flexible in its decisions about alternative investments (including REITs) and having an excellent solvency ratio. Accessible from € 50,000, the investor can count on one of the best back office of the area. An expanded offer of flexible UCITS and the best return for a euros guaranteed capital funds. For a while affordable with a low entrance ticket of € 8,000, the company has wisely raised the minimum payment threshold to € 100,000 and tightened investment rules on his notorious Eurocit guaranteed funds. Life Mobility Evolution is also the contract with the largest list of accepting countries other than France. The upscale craftsman serving your savings. The only contract fully compliant for residents in Israel. A reference shareholder: the Belgian State. 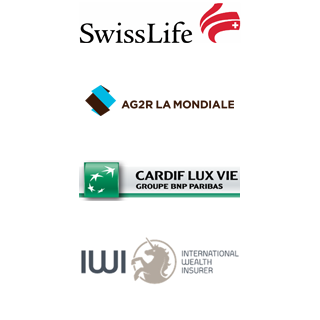 Premium Lux is SwissLife response for French tax residents. Open from € 150,000, it confers the strength and wealth management experience of the Swiss House for your capital. > The Luxembourgian life insurance is an investment solution that must respond to specific goals. Its implementation is based on the completion of a patrimonial balance sheet and by determining your investor profile (this is to measure the knowledge and appetite towards risk in equity markets). Our wealth management team will guide you through these steps during a face to face appointement. > Various Luxembourgian contracts introduced on this website (Espace Lux Vie de Generali | Life Mobility Evolution La Mondiale Europartner | Life Asset Portfolio Swiss Life | Borea invest Axa Lux | 4 Life IWI | BNP Cardif Lux vie | Global Invest Evolution Allianz | Profolio de La Baloise | Wealth Executive Life ou Amane de Vitis Life…etc) are issued from insurances companies.Cèdre Patrimoine Group acts as a broker distributor. * 0% entry fees for every first payment in your Luxembourgian insurance contract above 250,000 euros. Below this amount, contact us.